Back to the Future – Given that we’re now nearly in the future that was predicted in some of the Back To The Future (not this one – set in 1985, Michael J Fox travelled back to 1955). The story is great, the acting superb (especially by Christopher Lloyd – Fox is okay, but his face is just a bit too rubbery at times). Lots of great little jokes throughout. I watched it with my 10-year-old and was a bit surprised that the film that I remember as family entertainment has so much bad language in it, but that’s okay – we’re all adults here, right? 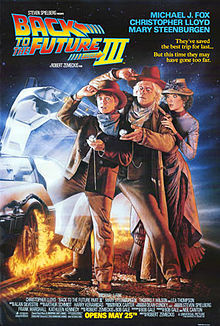 Back to the Future III – Great summary of the Back To The Future series, which was never re-visited (or sullied). Cool appearance of ZZ Top, hilarious “What’s your name, son?” “Uhhhh… Clint Eastwood” scene (when my ten-year-old son saw this he said “Clint Eastwood… that’s the guy who directed Flags Of Our Fathers and Sands Of Iwo Jima… he’d never seen a film Eastwood acts in until that point, only films he’s directed). The extras are good, especially the outtakes, which come with commentary so that you can understand why some shots were not used. One of them, where Biff is erased from existence in the 2015 scenes – probably because Lorraine shot him in 1990 – was not used because the audience didn’t get it. 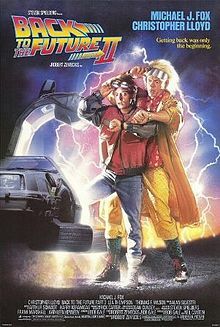 They initially wanted to take the crew back to 1967, since it would be fun to show that era, but they were keen to revisit the scenes of Back To The Future II. This entry was posted on Sunday, April 1st, 2012 at 7:35 am	and is filed under Uncategorized. You can follow any responses to this entry through the RSS 2.0 feed. Both comments and pings are currently closed.